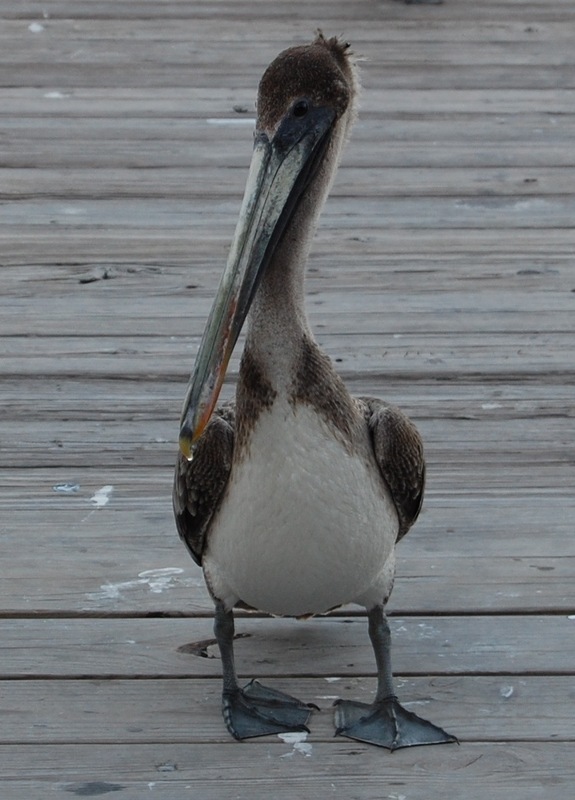 “I know I’m cute.” Pelican at Robbie’s. So, Kevin and I escaped the freakishly mild northeastern United States winter, and headed on down to Florida. We didn’t have mountains of snow or grey winter days as a motivation, just a longing for turquoise blue water and a hankering for snorkeling. We didn’t have any hotel reservations, or any set place to be. 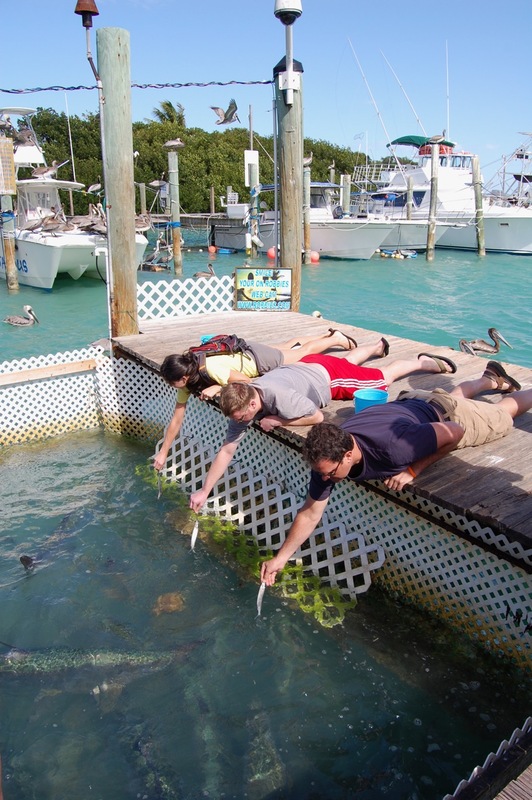 So when our snorkel guide recommended stopping at mile marker 77.5 to feed the tarpon fish at Robbie’s, we called it serendipitous and agreed to head on down to Islamorada. 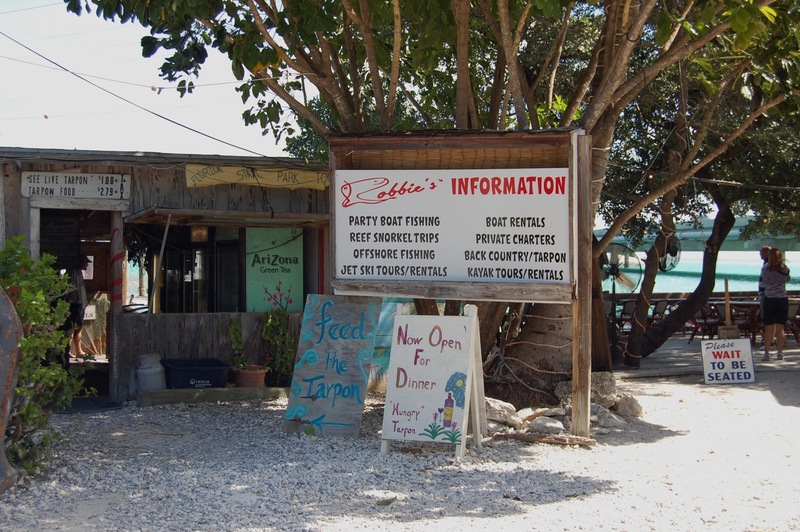 Robbie’s has a small restaurant down by the water. Little tables sit overlooking the view of the dock where white boats bob between the blue of the sky and the blue-green of the sea. The parking lot is full of vendors. Kevin and I admired some local art work, and got some chintzy tourist toys from one of the little huts. We rounded a corner where a view of the beach peeked through an opening in the tropical, green trees. And there… floating on the water… “Pelicans!” I screeched, and, camera leading the way, I dragged Kevin towards the two birds. 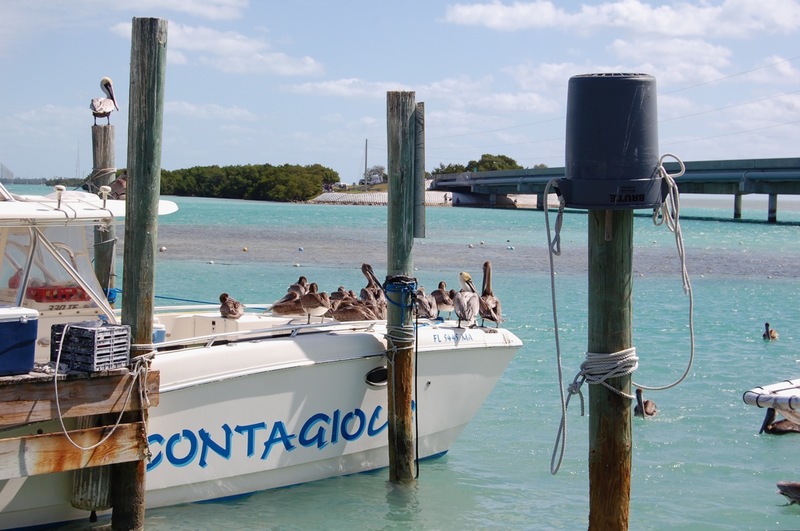 More pelicans sat in groups on some shiny white boats, gently rocking with the waves, and eying the tourists feeding the tarpon on the pier. 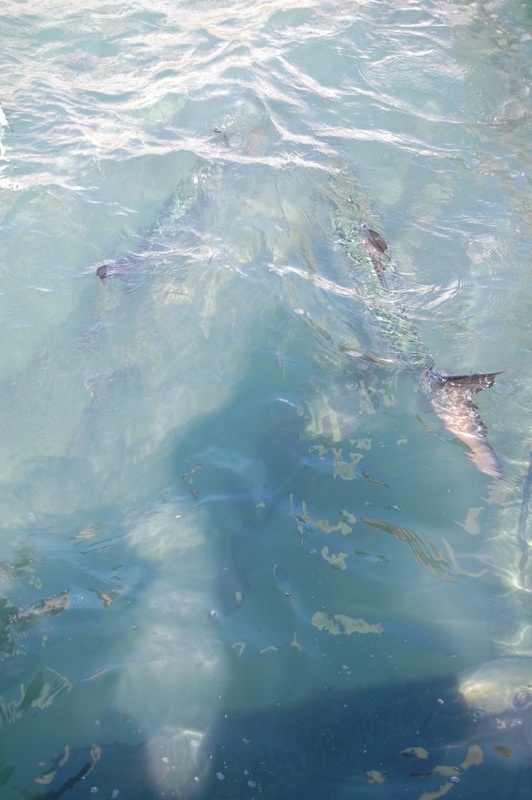 I had thought the tarpon would be the attraction, and for most people they seemed to be. 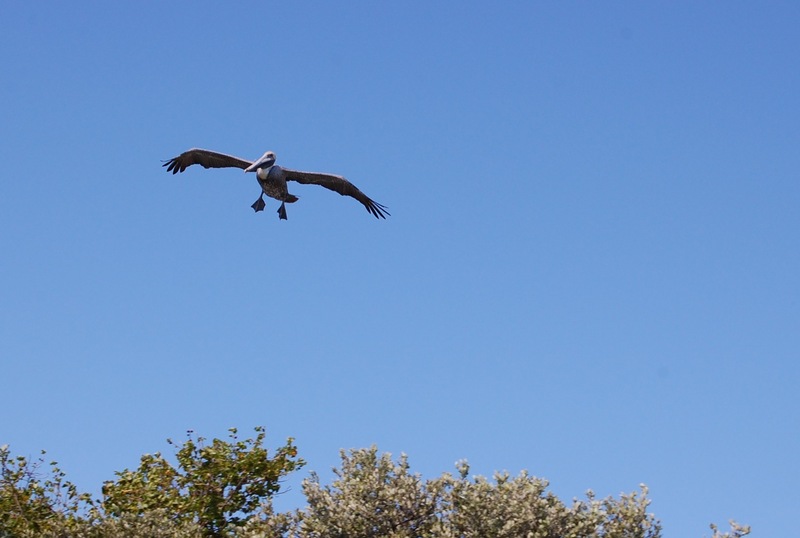 But for me, once I laid my eyes on those flocks of pelicans, they completely had my attention. 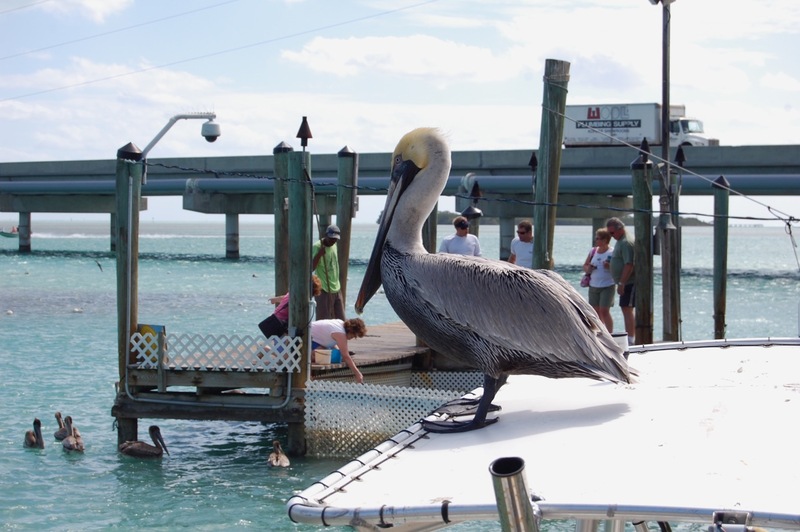 We nodded, and headed out onto the pier with our little blue bucket full of fish, where we instantly encountered two pelicans. 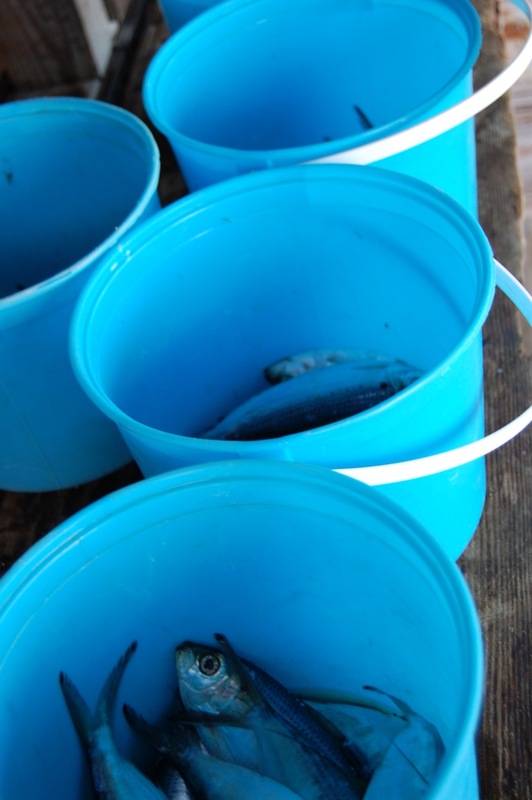 They were ganging up an a guy clutching his blue bucket. They weren’t really a threat, with a quick shoo they moved back and away. We headed to the end of the pier, where people lay dangling fish over an area of the water closed off with a white fence. Hold the fish there long enough and close enough to the water, and eventually a giant 4 foot tarpon will rise up and grab that fish right out of your hand. I studied the fence, thinking it was a mighty small pen for such giant fish. Soon I realized, the fence only goes a few feet deep. The tarpons are free to come and go as they please, something I deeply appreciate. 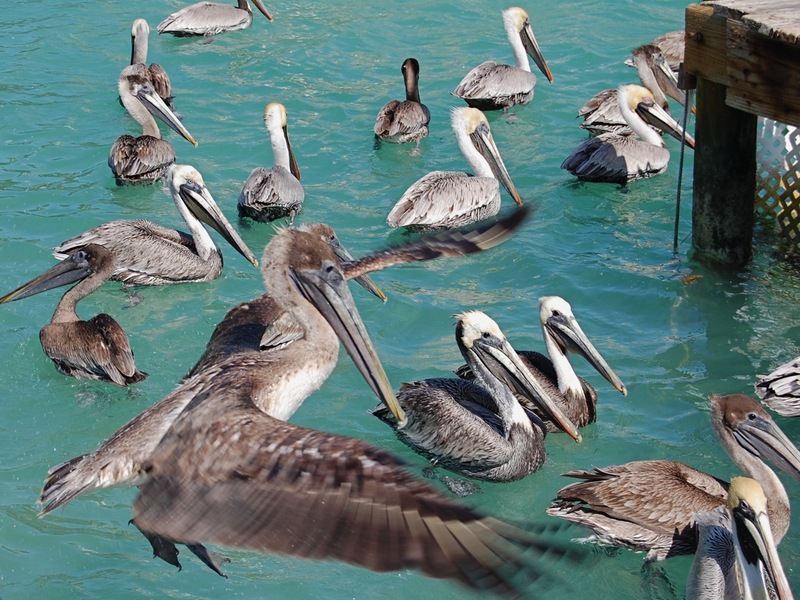 And then, in further wonderment, I realized that the fence was not there to keep the fish in, but to keep the pelicans out. Doesn’t floating in that water look so refreshing? Cheeky birds. 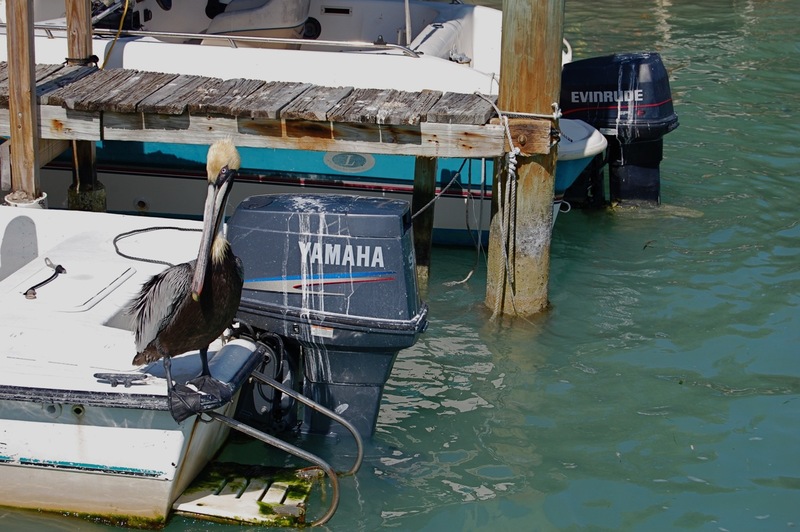 They pecked at Kevin’s feet as he dangled his fish over the water. They plodded over to me, investigating my camera and deciding I didn’t have enough food to be worth much. They boldly checked out every other person the same way. 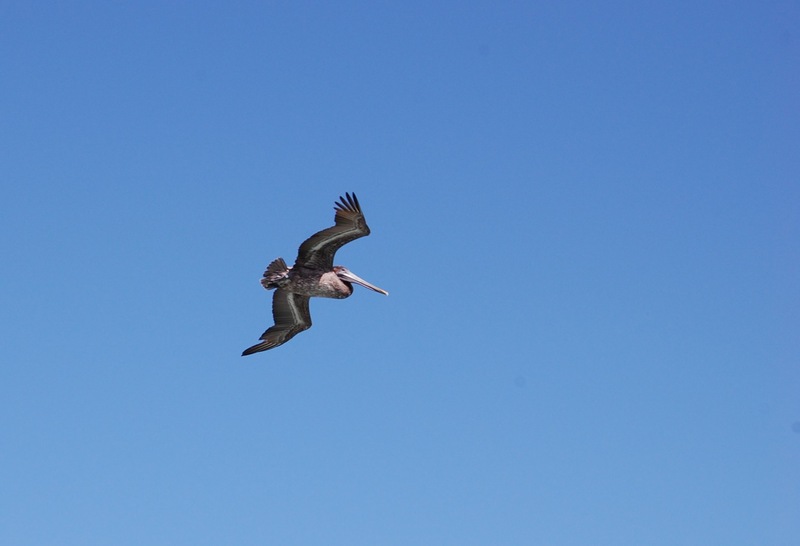 My first impression of Pelicans. 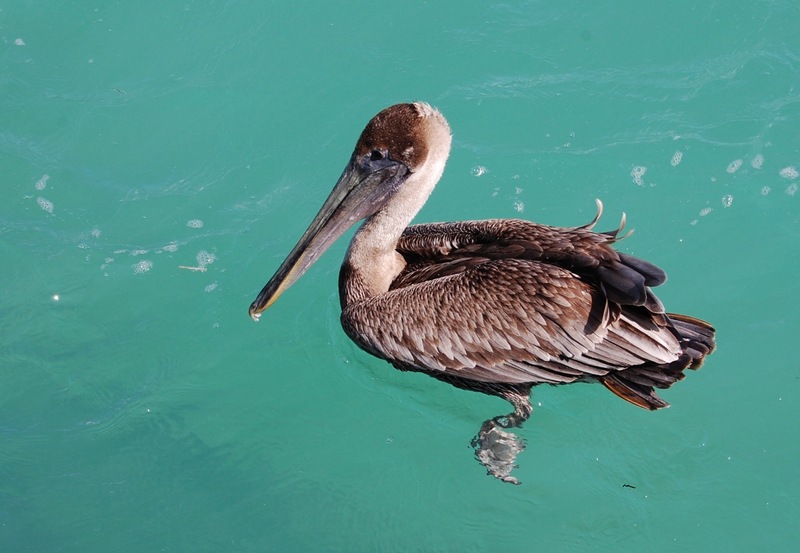 I always considered pelicans to be a rare sort of bird, a bird caught only in noteworthy glimpses in exotic places, usually while on vacation. I would watch them soar by the windows of my parents Florida highrise, filled with awe at the beauty and graciousness of their flight. Landing in the water with friends- looking for food. 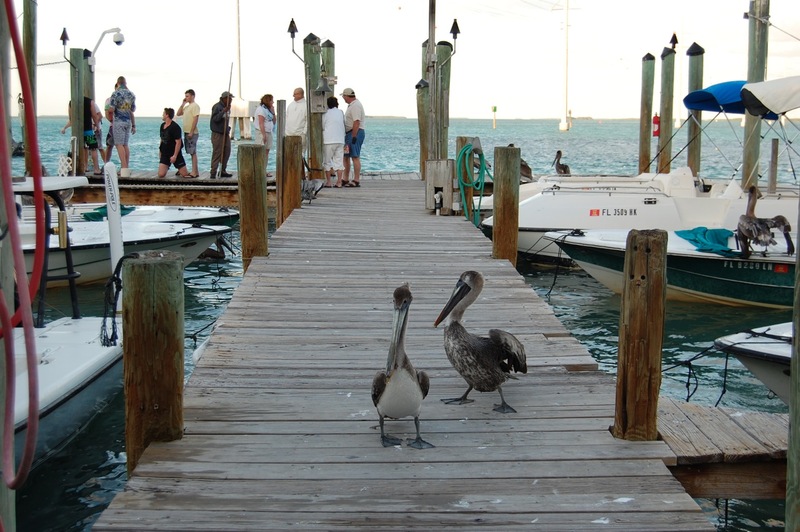 But seeing them here, watching the way they waddle down the dock, long beak awkwardly leading the way, pestering people, begging for food- pelicans suddenly appeared to me as, well… rather goofy… goofy birds with their plodding walk, and their inquisitive round eyes, and their funny way of moving their head left or right while counterbalancing the weight of their beak. 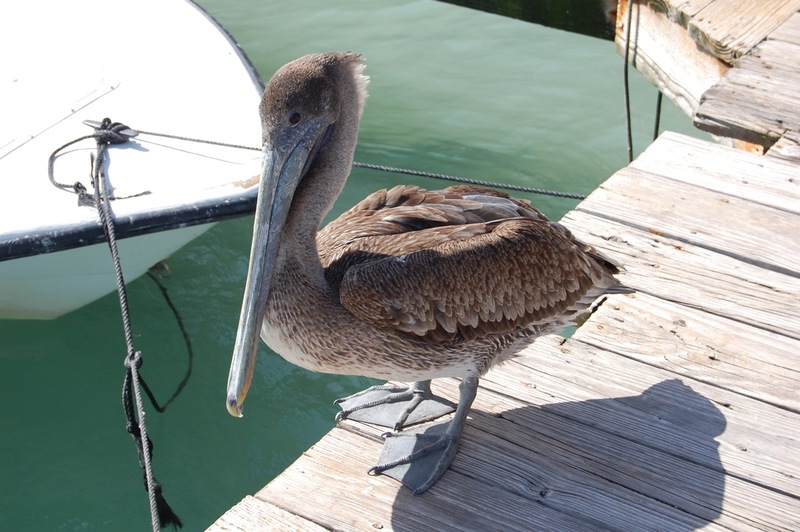 Never in my imagination had I considered pelicans to be a nuisance, a scoundrel flocking in the waters and crapping on boats and staring down children… a downright loveable menace. 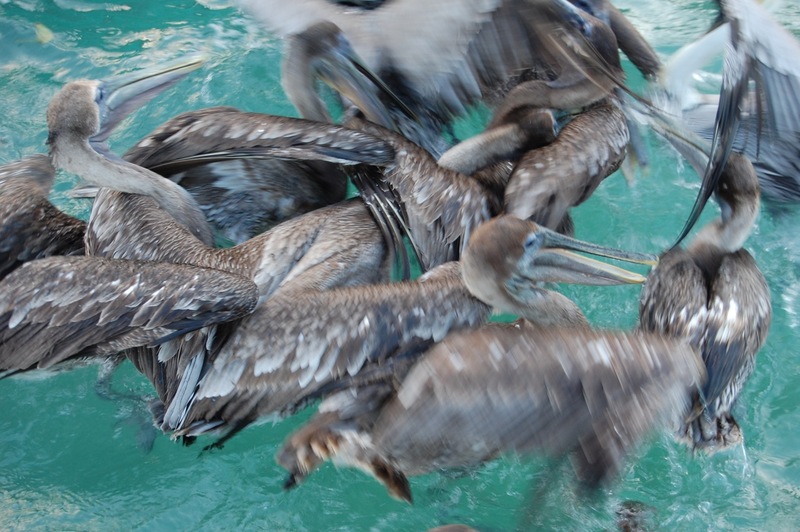 Pelicans, in all their pestering awkwardness, completely won my heart. I hope to get back to Robbie’s next spring. I’m already looking forward to spending more time gushing over these intriguing birds. I’m sure all my pictures give away how obsessed I am. I have even begun to paint Pelicans. I’m already on painting number two. But I think I’m selling the tarpons too short. They really are amazing and the story of their appearance at Robbie’s is truly heartwarming. Check it out here or go see so yourself! It’s a great family friendly place & they allow pets, too! The best part (in my humble opinion) is that Robbie’s is an up close way to interact with wildlife, while letting nature remain free! 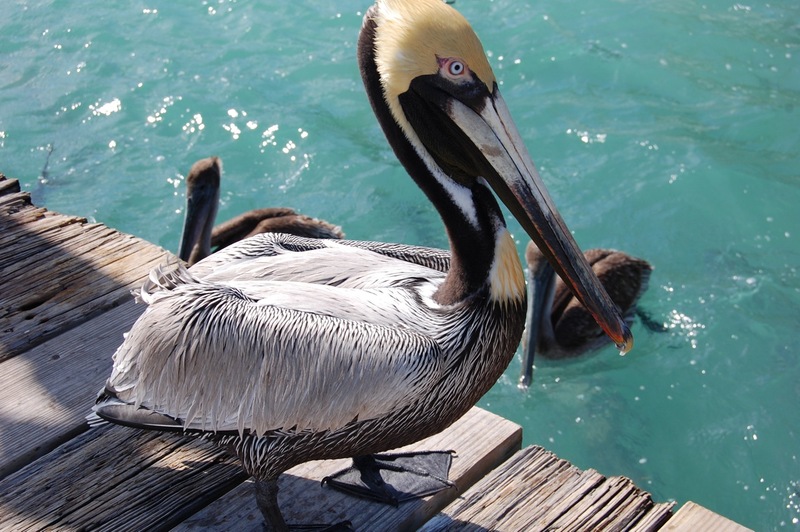 Pelican with yellow head and blue eyes.